An upside-down puff pastry tart topped with caramelised mango and lime zest. Wash and zest the limes. Peel the mangoes, remove the stones and thinly slice the fruit. Spread the mango slices out on to your work surface and use the tart tatin mould to cut them to size. 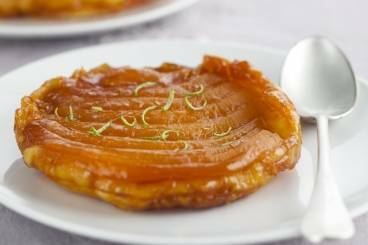 Use the same tatin mould to cut the puff pastry into discs. Line the tatin moulds with baking parchment. Sprinkle the lime zest into the base of each individual mould. Place the sugar in a frying pan and melt without stirring to form a caramel. Pour the caramel into the moulds and then arrange the mango slices on top. Cover the mango with a disc of puff pastry and pierce the pastry with a skewer. Transfer to the oven and cook for 25 minutes. Once cooked, rest the tart tatins for 10 minutes before serving warm.